I feel like you do, Michelle, when you say that this forum has helped restore a bit of your faith in humanity. I am thankful and so grateful, to "know" so many loving kind pet parents, when we all live in a world that seems ruled by cruelty, harshness, and greed. This is a gentle special place of loving souls, and our beloved babies knew that we would be blessed to find each other here, and introduce our new friends to our babies, too. It makes me so happy, that people who I may never meet, people who never met Buddy in this lifetime but one day will, love and care so much...it warms my heart, when nothing else does. I hope you find some peace Michelle. I will pray that you will be able to let go of any guilts and regrets soon...you don't deserve to feel this badly. Your strength and compassion is amazing Elise....Please know that you are in my thoughts and prayers - I am so sorry for all that you are going thru in your life. The loss of your precious son is burden enough for your heart to carry. I can't imagine how very hard it was on you to have to fight for the health and very life of your baby..... I truly can not imagine. My husband may have moved on and he may not completely understand the depth of my of loss, but he always completely supported my every decision for Lee Lee, never once questioned a penny of the many thousands spent trying to save her - for that I am so blessed. Just dropping by to see how everyone is. I loved your pictures and your stories of Buddy so much, he looks so happy playing in the snow and he's so lovable with Katie! He's such a dear! I'm so sorry for everything going on in your life right now. I can only begin to imagine what painful it must be to have to cope with all that on top on losing your sweet boy (or, rather, losing the comfort of his physical presence). I had to wage a similar battle with my parents during Rufus's illness, but I'm sure it cut so much deeper in your case. I don't know why more often than not it's the kindest and most loving people who are faced with such trials... Maybe Bedomum is right and it's just God's way of bringing out in us the strength we didn't know we had. You take good care of yourself, keeping you in my thoughts and prayers and wishing you peace! I think you are right A, me Buddy is a lot like Bowie, we let these small girls boss us around, that's so cute that the little Chihuahua's are acting like his step mothers...that gave me and mom a belly laugh! Just hope that Bowie's feelings don't get hurt and that it is more "play bullying"...I was OK having Katie be the "Little Miss Boss" of the house when she was with me...maybe she felt insecure because of my big head and bigger size so she had to act the part! Sweet A, you have true words of wisdom when it comes to Love's Nature, and the broad and specific meanings. Mom is starting to understand more about how she must take care of her life, and how love for one's self means having to reclaim independence sometimes...mom lost some control over her life, and all you sweet moms here, coming together to support her and hold her up, your big B nephew is so grateful that you are helping take care of her with your love and kindness! Mom agrees with you A, that you two legged's can learn to take care of yourselves without being selfish, having a "strong head" as you say, you have the ability to give so much love to us fur babies, heaven and earth! Sweet A, just like little B is helping mom stay tough, he is helping you his sweet Mom, too...to face the complicated parts of life and come to more simplicity. Mom really feels the love from the "aunties" who are looking out for her now...we kids brought all of you together to help each other find your way, together...you know it is a fact! Lee Lee's Mama, she is hurting today for missing Lee Lee it is her 10 months Bridge Day today and her day would not be the same, if me, Bedo, Max, AA girls, Patches, Rufus, Bailey and all of our gang...(and so many more...not leaving anyone out) were not here to celebrate it with her...do you see sweet A, that we are here at RB to fulfill our purpose? We fulfilled our earthly one, now we are working on heaven's...we are doing a breakfast brunch for Lee Lee today, sweet A...I am heading back now, to see how everything is shaping up...Bedo is in charge of desserts, I think he has a fruity one in mind...(it may have some Chinese pears in it)...but it will be a surprise! Me and mom, we send you Sweet Aunties so much love and big hugs today, me bubbly boy with the big head is thinking of you and sending lots of angel wing comforts, and a "pretty" from Lee Lee for each one of you who is missing their baby today! I'm glad you liked my sweet girls baby picture. I can't look at it too close or long because it still hurts and sends that stab to my heart. Still missing her more then ever. Yes Elise the best things in life are free. My beautiful little rabbit Patches, this forum here, meeting all of you, being able to talk and listen to all of you sweet souls, you all genuinely care. You keep smiling okay, Buddy will be so happy to see his Mommy smiling. I so enjoyed that sweet letter your Buddy boy wrote to Bedomom. It helps, more than you know, to hear of my Angel in the midst of all her precious little friends - the "gang", the "tribe", and them pampering her on her special day. I know that breakfast brunch and desserts were just awesome - I'm sure it was gone in no time flat! ...More precious pictures to pour over when we are all together one day! Thanks sweet Elise.... a "pretty" from Lee Lee for you too!! Thank you so much, for your ongoing support and compassion - I don't know how strong I am, as I just seem to be placing one foot in front of the other these days, but I am striving to be more compassionate. I try not to think about all of the additional trauma and stress that accompanied Buddy's illness, too much...it was such a dark time and better left in the past. I know Bud wouldn't want mom to dwell on it, too much. I am so glad that you had the full support of your husband during Lee Lee's illness, as he knew she meant the absolute world to you. I am happy that you enjoyed Buddy's letter to Bedomom...that furry golden headed thing loves to be involved, so much! I know our little 'tribe' our sweet 'gang' had a wonderful celebration for Lee Lee's 10th Month Bridge Day and for sure, they gobbled up the goodies without hesitation! We certainly will have a lot of fun catching up to do, once we arrive...lots of pictures and videos of our babies' special celebrations during our 'absence'. Thank you so much for dropping by, it means a lot to me to have your kind and understanding support. I am glad you enjoyed the pictures of Buddy, and also with Katie...I have a few more of the two of them together, that I will post soon. I hope you are doing better these days and feeling sweet Rufus close by. I like to think of Buds as "only a heartbeat away"...and I can still picture him by my side, and always will. I'm so sorry that you also found yourself in a battle, during Rufus' illness - I hope things are better for you now. It is so interesting that you refer to Bedomom's thought, that God brings us trials to strengthen us and get us to grow, regardless of the pain involved. I just watched a movie tonight, called "Grace Card" - it was so touching, a story of transformation through forgiveness and grace...it was a bit of a tearjerker and at times, it made me miss Buds even more, but am still glad to have received the gift of the film's messages. Thanks for keeping me in your thoughts and prayers...you are also in mine! How are you this Sunday? It is funny that like mom Sunday is always a special day for A and Bedo as Sundays have always been the day that A is home with Bedo and the kids! my Tofu Boy, reading your letter is such a blessing and A is glad that it brings happiness to Lee Lee's and Patches's moms as well...reading your letter, a feels that you and mom are considered One soul as you both understand and love each other to the pony that is inseparable, no matter where you are! A did watch a couple episodes of after life TV it is very interesting about the spiritual world, if we believe in it, we will find a lots if phenomena and convincing issues, if we don't then it is a matter of choice,,, the spiritual world takes us to the next level of understanding and we need to have a very deep, honest and compassionate mind to experience it. With that, it will bring us peace...Sweet Boy, please try to help mom bring all the bad experience to the past,,,A knows it is easier said than done, her love for you is so great that it overrides everything...lets help her know that it is only the love and sweet memories if you that she need to carry on with her...with this positive energy, she can walk through the rest of the path of her life with peace...she does not need to burden herself with anything else,,, a knows how much you two love each other from your pictures, it is a heavenly blessing bond that only the kind and sweet spirits can experience it and it is definitely the richest asset in life! A took Bedo outside yesterday morning let him feel the fresh air, and took him for a walk around our yard,,,after that A cleaned up his spot and it looks much better now...a feels that Bedo is always with A to guide A to peace..As after his passing A is seeing thing much more clear ...A feels like no matter how tough life can be, it does not matter anymore as A is constantly working on inner peace...A brought salmon brown rice for Beed yesterday with mini sugar tangerines a hopes he shared them with you and all the angels. Chinese new year is coming soon, will send more Festival foods for you all! Sweet boy mom misses you and it hurts her to see Katie were looking for you, a knows that little missy is bossy but she loves you! Who would not for such a genuine guy...visit mom in her dream to make her happy! Love you Sweet Boy and hugs and tummy rubs to my baby! Thank you so much, for your sweet loving support, and of course I've already received lots of "hugs" from you already! I am working on taking care of myself both physically and mentally - will finally be able to attend the yoga class this coming Thursday, for the next 8 weeks. Then once this one ends, there are other options for continuing. I hope that you too, are taking care of yourself as best you can...I know how hard it is Jamie, you miss her so much...try as we might, we look for ways to fill the huge void that is them being gone from us physically...some days, we do OK and others, not so great. I was out walking this morning on the private road with dear Katie, and just started crying, thinking how he should be here, romping in the woods and jumping for his snowballs. I just never thought I would lose him, so soon...but my baby had other plans...God had other plans...maybe he really did choose his time, maybe his 'soul contract' was up for this life, and he had completed his earthly work with me and with others he came here to serve, bless and comfort. It's all such a mystery, don't you think? I try to make sense out of it...make sense out of my life now...what my purpose is, try to be strong in the knowing that the inevitable changes that are coming, are for the best. I am just so grateful Jamie, to have you and the other sweet precious folks here, to turn to...thank you for being such a good pal, there are no words to describe how much it means to me. Double BB Boys are are so proud of you! You know Beed was right there with you when you did the ritual with him in between the rain drops, taking him outside your house to let him run free and feel your yard again! Bedo was there to help you, he loved being a part of the Ceremony to help you realize more deeply your connection, that your two souls are joined together and are One! Inner peace is one asset we kids have to share, in our earthly life and especially through our heaven life connection with you...you have discovered a profound Truth, sweet A...the most precious assets in Life are the intangible ones that continue beyond the flesh and earthly existence. We babies came to be your teachers, your helpful guides to experience the deepest most special parts of life and we are blessed too, that you took care of us and gave us our love and affection and of course, the tummy scratches and treats! A, Bedo knows you could never ever forget him and he loves that you continue to honour him by including him in all activities and routines of life. Your way of doing this is helping my mom, helping her as you lead by example to not get discouraged or disconnected from life and to come to a better place, we Double BB Boys want our moms to live life to the fullest because you have us babies with you, for comfort and inner peace through every moment. You have the right thoughts, sweet A...we BB Boys want you to cultivate inner peace, and to have Joy again...cooking the ritual foods is a great way to keep grounded and connected, too! We are looking forward to Chinese New Year's sweet A...I have learned so much more about your culture now that Bedo is my shortie twin! It is my 4th month today, Sweet A...the kids are planning something for me today, I'm not exactly sure what's going on behind the scenes but little B has been sneaking off and whispering in lots of ears so I know they are up to something! Love you dear Auntie...we are sending you lots of positive energy and thank you, for helping out mom so much, and lots of other parents, too! P.S. Sweet Aunt, you make me laugh a little bit about the spelling mistakes! They are not mistakes...they are just new words to the English language from Chinese! Mom wants you to have the best time ever today, sweet boy...mom found a few pictures of Joelee, snuggling with you and Katie on gram's couch last Christmas...you looked so squished! But you didn't mind because you love to have lots of affection and cuddles. Bud says, "How am I supposed to sleep like this?" Love you always, sweet little man involved...please give all your big gang up there lots of hugs, kisses and tummy scratches for your Big Day! Today is your 4th anniversary, how time flies...A know poor mom must be missing you so much, missing your lovely face, missing your sweet hugs, missing your prescence to feel the house with warmth, and missing your genuine kind loving big soul...she missing her son, her baby...A know it mus be hard for her to have a walk with Katie in the same path...baby A just wish mom peace in her heart on this special day..be with her and tell her that you are walking with her every step of the way! Please come to give mommy a sweet big hug in her dream she loves and misses you so much...you are a part of her but she has to function without that important part...a very big challenge..please help her boy! It is such a coincidence that today is the 15th of January (also the 15th of the Lunar calendar for the end of the year) our culture takes the 1st and the 15th to be a spiritual day...A had already put some nice fruits for Bedo...but the 1st and 15th suppose to be vegetarian day..so Sweet Boy, just eat the fruits to be healthy for one day, will make it up to you on Chinese New year's eve...you will have a big feast by then...A is so glad that you start learning some of our cultures, A hope it will enrich you in some ways...A just follow A's heart in doing some mini rituals for Beed at special anniversaries or occasions, A just love him so much that A wants to honour him, it somehow helps A to find peace...Pictures of you and Joelee are so sweet with Katie too, you are just a bunch of sweet kids having a very good time together...sometimes A just wish things will always be the same as for sentimental people like US...being apart from our babies is unbearable...like Patchesmommy and LeeLeesMama, we all facing a very big challenge to stumble in balance of our lives...please keep us to be strong in our love as we all love our babies very very much...A loves all of you, A knows today is your special day and you are seeing all the beautiful up there , Tell Beed that A loves him to pieces, A loves Patches' Sweetest and cutest face as she was an angel sent to Mommy Patches and her brother, A loves Lee Lee's Country and Tomboy look but she is no less beautiful than any glamour girl, A loves Max's cutie and funny look, A loves Allie, Allycat, The White Prince, Rufrus and Chances too, a beautiful boy who's parents are still hurting and bless their good hearts, A loves Koji, Butterbean, Harry, Bailey, Saracub and all the babies that A can not name all..A just want to take this opportunity to Wish my sweet Boy a happy 4th month bridge day and send A's best wishes to all the angels up there...baby boy, you are just so sweet, you are such a big warm, soft pillows for Joelee and you are no different than a sweet two-legged cousin in your soft fur coat..baby A just want to say A loves you, have a blast up there, and don't forget to come to mom's dream to give her a big hug! Hugs to your Sweet Mom and A wish her peace and strength on this day, if she cry, they are tears from loving and honouring you, her Sweetes Son! Happy happy bridge day to Buddy. No doubt he is having a blast with all of his new friends. I am thinking of you both. You are right there is absolutely no making sense of any of this at all. Try to and I can go crazy. I still miss her extremely bad, now more then ever. My mind knows she's gone but not my heart. I still expect to see her face walk around the corner, or see her face pop up at the top of the pet stairs to our bed where she'd walk over and cuddle up next to or on me. It all just breaks my heart and soul and hurts so very much. I know you can relate. I can just picture you walking cutie Katie earlier and hoping so much that your sweetness was there with you. I know what your feeling and I am so so sorry. Huge hugs Elise. I love love the pictures of the Buds, look at his face next to Joelee even if he was was squished I'm sure he loved the snuggles. His face is sure sweetness. Thank you for always being such a good pal back. I love your precious photos of your Sweetness with Katie and Joelee - such love between them. I think you nailed his thoughts Elise - that face is just too cute. I know his Bridge Day was just as awesome as he is - with a wonderful party and gifts from his friends and a special pretty from Lee Lee. I know you miss him desperately....walking along his favorite paths without him must so hard for you, remembering all the little things he loved to see and do - it is just all so unfair. What a nice request from the Golden Rescue - even they know how special your baby is - I'd love to see the photo you select for them. Hugs Elise - I am thinking of you and praying for your peace and comfort. Thank you, for your sweet thoughtful letter to me, on my 4th month Bridge Day! Well, as it turned out, Bedo had it planned according to your spiritual tradition of the 15th in your culture, and we feasted on delicious fruits, some tasty nuts and even a few veggies! We kids are going to enjoy our special fruits and vegetarian delights on the 1st and 15th from now on - I am so lucky to have my Day on one of your special spiritual days...see, another sign that me and Bedo belong together...Double BB forever! Sweet A, it is so true what you say in reference to mom...she does miss me with all of her heart, my genuine face and loving deep brown eyes...she misses my presence and my greetings and our hugs...she was looking around in the car today, still seeing my golden hairs and nose prints on the window...she still talks to me in the car like I am still there...and really, I am still there but she just can't see me, the way she used to...how I wish I could be with her, like we were when we were together on earth! To be very honest dear A, all of us kids wish for this, that we could have had more earthly time together, but as you know the one thing we can all depend on is change, and it was just our time to make the leap from this world to the next! Mom does feel me...she knows, I am walking with her every step of the way and that I never could leave her side...she still looks for me in my special places, even tonight on the walk with Katie, the moon was as full as full could be...it glowed so much it lit up our whole road, and my mom looked over to one of my favorite spots, where I loved to romp...it is a little duck pond on the other side of the road where there are only woods for miles and miles, it is all frozen over now...mom calls it "The Buddy Bog" because I would always be such a mess coming home from there, when it wasn't winter time because in winter, I wouldn't get so messy because everything is frozen! One time, I made mom late for an appointment in town because she was trying to clean me up and brush me and get the burrs out, because I had been playing in the Buddy Bog and I knew I was being absolutely rotten...(she called me "rotten" sometimes, because I would pull these little stunts, but she always said it with so much love...and she knew I just loved to tease her!) I think mom will take a picture of my bog sometime, to show you in the daylight, and you can picture me playing down there...we have lots of fun bogs and all kinds of cool places where we play hide and seek...every game imaginable...and it doesn't even matter if we get a little messy because miraculously, we always are clean again! Sweet A...thank you so much, for making mention in your letter, of the many beautiful fur babies that are in our loving group, we all love you just as much as you love us! We promise to continue to try and find ways to comfort all of the hurting moms and dads...we know it is so hard for you to be away from us physically right now...Bedo loves so much, that you honour him in the special little ways you do...that you still include him...it makes him feel like he never had to leave for RB! Thank you A, for giving so many sweet thoughts and words of comfort to mom, and to the other moms and dads here...you have a special way of speaking from the heart that is very genuine...mom is so lucky to have you and her other friends who have their own unique style of comforting and speaking, who are also very genuine and special and supportive. Mom is thankful, for this special place where we babies have brought you all to, and she will never forget the many kindnesses she has received and continues to receive. I just loved all of my affections from you, Sweet A...all of my tummy rubs and scratches and yes, even though I never got sick of them I did pass them around and share them because what fun would it be to keep them all to myself? All the kids say "Thank You" from the bottom of their hearts! Love you very much dear A...I am with shortie B now, and we are planning our next celebration...we have one every day, but they are never the same, they are all special and unique because each one of us is special in our own way and we love variety, after all! Angel Hugs to you from our Big Gang...we know how much we are loved!! Thank you so much, for dropping by to wish my baby a happy bridge day...I do know, that our babies are definitely hanging out and enjoying everything that their new life has to offer them. It is just so hard for those of us left behind...not to be a part of that in person! I started the yoga today, and it was just wonderful...absolutely, it is a part of what I need to be doing, for myself. This is a very basic and rather slow moving class...I am the youngest person in the class...many are retired senior citizens with all kinds of degeneration issues, arthritis, inflammation, etc...and other things happening within, that make any new movement a challenge for most of them. I love the philosophy behind this - it just resonates with me, so much. I know it is going to be a very important aspect of my healing journey, to be a part of this. I love the instructor...she is very humble, thankful for her students, who she considers her greatest teachers...really neat lady. She mentioned that this class is not only for proper body alignment, toning and conscious breathing, but works on the spiritual level as well. She mentioned that this is a journey with grief also...learning to reconcile to our grief, and not only the grief of a beloved human or pet, but even the loss of being able to function, or use one's body in the way we used to. When she mentioned grief, I almost started crying...and I know that I will most likely cry at some point during this class but that's OK, because it is a very safe place to do just that. I am glad you liked the pictures...yes, my baby had his Sweetness Face on! I have to see pictures of him every day Jamie...I have to look into those eyes, look at his beauty and softness and breathe in his gentleness...I know you understand...I have to connect with him...have to feel him in my arms, in my heart's most quiet place. Our yoga teacher shared a profound expression at the end of class by Saint Francis de Sales...she read it out loud..."Nothing is so strong as gentleness...nothing so gentle, as real strength". Then she told us that we were strong...stronger than we give ourselves credit for. Our babies were so strong, weren't they...and aren't they still? They are being strong for us Jamie...they are encouraging us, in their sweet and gentle ways and it is up to us, to meet the challenge to be strong for their sake, for upholding the beautiful legacy they have given us and continue to give...unconditional love, unconditional kindness, compassion, wisdom and so much more that words cannot express. Jamie, Bedomom's message definitely put a smile on my face, and tears on my cheeks...it's OK I love it...every message I receive from any of my dear pals here, seems to have that affect on me! It's all good...it is part of the healing, and Buddy knows his mom is made of Tofu, just like he is! Oh well...there's the real challenge...looks like mom will have to be made of firm Tofu instead of soft Tofu in order to be strong, yet gentle!! Elise, a sweet letter to your sweet golden boy. I am sure he is enjoying his time at the bridge, but I believe he pops in to check on you also. Perhaps he takes the walks with you, along the same path, and he watches the squirrels scamper along the path. I know that it can never be the same, for an important member of the family is not with you physically anymore, but I like to believe they are still there in spirit, and they keep an eye on us. Those pictures are worth a thousand words, aren't they. I think it is hard to really pick a favorite, for they all show so much personality in them. Thank you so much, for stopping by...I am glad that you liked the photos of Buds, Joelee and Katie...there is a lot of love going on, that's for sure! I know that your angel Lee Lee gave Buddy the nicest pretty for his special day...she is one very thoughtful Country Blossom gal...I can just imagine her running like the wind around your place! Had Katie out for a walk this morning and decided to take the camera with me....it was lightly snowing, and little did I know how difficult it would be to walk in the woods for a ways, off the road, to try and get a few shots of the "Buddy Bog". The snow was up past my knees! How sad, that I never took a movie of him playing down there, or any pictures...I just assumed, that there would be lots of time for that. The lessons have been so hard, haven't they Melanie? I also took a few pictures of his nose prints, on the sliding glass door overlooking the snow covered lake...there is this little island out in front and Buddy loved to go down there along the shore and play, and also at the neighbor's next door - their place is seasonal...they have two dogs and were very welcoming for Buddy to come over anytime...(he would sneak over there and swipe their tennis balls, the rotten thing, and bring them back prancing...all proud of himself!). It is hard Melanie...it is sad, to be walking this road especially in winter, without him...I just never imagined it. But as brenrae wrote just a little while ago, they are with us, they keep an eye on us...but even with the knowledge of this, we are still so deeply affected by their physical loss and presence from our lives...it will take however long it takes, to come to a place of less pain, less desperation. Especially at first, it seemed so completely unfair, that he would not be here to enjoy the winter and have his earthly life in what had to be his favorite home, ever. It was the only place we lived, where he never wanted to leave...before, he would be so ready to just jump in the car, but not here...he adopted this place with his whole heart, and now it leaves me feeling so bittersweet - the fact that he loved it so, and yet now, so empty and isolated without him here to have more precious moments together, make more beautiful memories. Yes, it seems so unfair but I have to believe, and I know this is going to sound so "clicheish"...that his passing, and the timing of it happened because it was supposed to. He was on loan to us, to our family...he truly was an angel sent from God, and God called him home...so many changes Melanie, in just the past 4 months, it is amazing to me, what this little man has managed to put into motion. I can only pray, that the outcome will be for his mom to fulfill her highest purpose in this life, whatever that may be, because I know he would want mom to do that. Melanie, when I wrote to Jamie about the yoga class, and how we need to be strong for our babies, I was also writing to you, to Bedomom and to anyone who comes here, who understands the depth of our pain and sense of loss. I hope so much, that you will find some comfort very soon...that your heart will heal, with your precious Lee Lee's help, because she would not want her mom to feel so sad all of the time. Our lives go on - they continue with our babies because we could never leave them behind, there is no such thing as "moving on"...that only exists when no true love is there. I pray that all of us, will find some joy in our lives again and the precious inner peace that will make our passage to the day when we reunite with them, blessed and filled with gratitude for having had the privilege of sharing our lives with them...for having had the privilege, of being their "moms". I'm so happy to hear that you started yoga and that you loved it! It will be so good for you :) That's great about your teacher, I think the teacher is a big part of yoga. The studio I go to is very big and I definitely have my favorite teachers there. I agree about it being a journey of grief also. I never looked it at that way before. I haven't gone back yet still. I feel like I'm procrastinating, and that's not really like me? But then again I am not the same person anymore. I know for sure I will cry. I cry a lot still, sometimes when I'm not even aware I am. At my office I have to remind my face all day to keep "smiling" I wonder sometimes if my clients can see though my fake smile and see all the sadness through my eyes. I promise I try real hard not to show it. Even now as I type I catch my reflection of my face in the monitor..... I look just awful. Its such a fine line for me to always wanting to think about her and not thinking about her at the same time. Its a rough rough life for me now, I'm aware things could always be worse (DUH) I remind myself constantly of this. I think of so many many memories of her, some I had almost forgot about and instead of being grateful and happy I had them it makes me hurt. I sound like a brat huh? Like you I HAVE to believe that this wont be this painful forever but then I don't want to feel like I've "moved on" I never will. 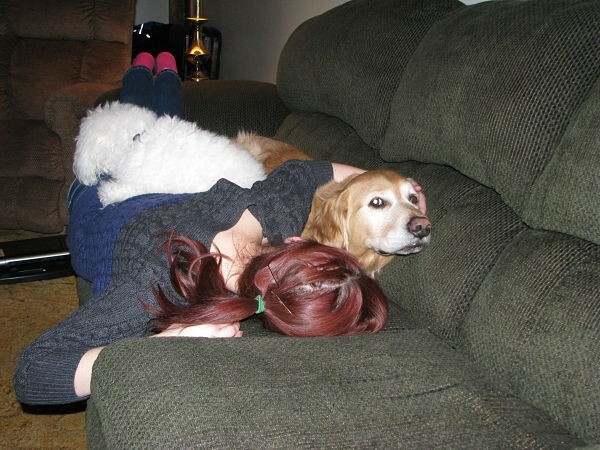 Patches was everything to me, I will LOVE, MISS, and think of her everyday until the die I day. She more then deserves that. I envy that you can look at Buddys pictures look into his soft sweet eyes. If I look too hard or long, I turn into a quick mess. I will try soon to add some more. Maybe of Jake and Patchy. My boyfriend has been wonderful through all of this and knows all about Buddy Lee Lee & Bedo. He's seen pictures and sometimes I read him the kind words. He sent me this picture a while ago. I'm thinking of you and the Buds and will be sending you warm hugs for you tomorrow. Thank you for writing - and thank you, for inspiring me to write my boy in the loving way that you write to your sweet Har Har. I love how you send him hugs and kisses on the wind...if that is not pure love poetry, I don't know what is. I know my baby does walk with me...I can still see him playing and jumping in the woods, chasing squirrels...chasing deer...(it was just a game, he would have never actually caught up with them! )...just being his beautiful self out in nature. I know our babies never truly leave us...their spirits are always close, but isn't it nice when we get a little sign or a dream? I wish that for you...that your baby will come visit and let his mom know, how much he loves her. I still can't pick a favorite picture...they are all special and precious, in their own way and time. Another Sunday again, reading your sweet letter A feels your love for mom is bigger than Lake Ontario! You two have such a sweet mother and son relationship! A knows mom's life was all around you her Sweet Son! her daily activities were all involved her Sweet Buddy Boy, going for a walk to the wood, a trip to town...Baby, mom had given you such an advantuous life, it is a kind of ideal life for Golden Boys! you loved the nature, loved to be outside romping in the wood, in the snow and mom had given her Sweet Son all that! The little duck pond, your Little Bog must be such a sweet reminder of you.A wishes mom smile when looking at that Sweet Little Duck Pond as it is filled with all the sweet memories of you. Your nose print is forever by her side and you sweet Genuine face with your beautiful brown eyes are imprinted in her mind and in her heart! The Picture of Sweet Mommy Patches is so touching, it is so warm, loving, peaceful and hopeful for all of us heart breaking moms...The picture shows Buddy, Lee Lee and Sweet Patches are anxiously waiting for our moms and for Bedo too..A thinks that Little sneaky guy must be outside playing and you three were wondering where he was! Thank you Patches mommy, A knows Bedo loves you all so much that we all stick like crazy glue now..A is thankful for the source of comfort from all of our mommies and daddys here! and you all angels are joining force to expand our love connections from heaven and earth, babies, we all walking on the path of love together, on a parallel lanes, side by side, not to far from each other...A is baking the second turkey from Wallmart today as it takes room in the fridge, A is stuffed the turkey with sticky rice, will send some for Bedo, you, Patches, Lee Lees, Max, Rufrus, Chances. Harry, Baxter and you all of our angels! Last night, looking at the picture Patches mommy sent mom, A gazed at it for a very long time and felt very peaceful. A was very tired last night and had a very good sleep, A had the sweetest dream about Bedo...A dream that a saw lady bringing a puppy to A's house and A was going to get milk to feed him as he was still very little...later, A found Little Bedo laying in front of the hall way near A's bedroom...A picked him up, he was fragile and tinny, like a Bedo Baby.. A pet and felt him and was going to get him some food..A is not too sure about the dream, maybe Bedo was telling A how he had came to earth...A knew he was Bedo but a young Bedo...Ah so interesting, A wish you will come to mom's dream as she needs you boy! A is glad mom is taking Yoga as it is very good for the body and mind..A can tell mom has learned a lots from her first lesson already! A is so happy for her...Having a few babies, A does not have much time on hand, but A try to think of good things while walking the babies, enjoy reading and eating healthy...so far A is in good health and is working very hard on a healthy mind...A knows Bedo is around to guide A every step of the way, the thought of him despite a bit painful but it somehow gives A strength and comfort..A sure mom feels the same. OK A is going out for lunch now, a friend just called! Take care sweet Boy, visit mom in her dream! Love you and send tons of love and tummy scratches to you Sweet Boy, send A's love to Beed and all the angels! Thanks for stopping by...I know what you mean, about not being the same person anymore and that you weren't one to ever procrastinate, when it came to something like doing yoga. How could we possibly be the same people, after having gone through what we have? I watched a movie last night (it was a Christian film and did it ever have a good message, about loss, taking for granted what we have, gratitude and taking responsibility as a parent (in this case, as a father)...watched it on Netflix, it's called "Courageous" and I cried so much, during that film. The acting wasn't perfect or anything, but all in all, really good messages throughout and for some people, it wouldn't trigger an emotional response, but it sure did for me. I am truly amazed, that you can deal with people face to face at work, especially for any length of time, like enduring an entire work day. I don't think I'd be able to do that, I'd have to have somewhere to hide. This week, I have a phone call with a well known online marketer...I may be doing some writing work for him or maybe he wants to joint venture, not sure what he has in mind but he noticed me and wanted to make contact, because I was posting on his blog and even posted about Buddy, so we will see how that goes...wouldn't be surprised if I end up bursting into tears, if he mentions Buds. I know what you mean Jamie, when you say it's a fine line, between wanting to think about Patchy, and not. On these Sunday's especially...when I think of Buds I feel so sad and bummed...just feel so much longing for him...just miss him so very much. This woman Lori posted about her pup that she lost four and a half years ago, and she said that she doesn't cry anymore...that she smiles and is happy now, when she thinks of him. Yes, she always misses him, but the intense pain of first loss has dissipated, with time. You don't sound like a brat - not at all! You sound like a hurting mom who would love to feel happy and remember your baby fondly all the time without feeling sad, but you haven't arrived yet...it's just too much to ask or expect. We'll never "move on" Jamie...it isn't possible, to move on without them. We just have to adapt to the new way that they are with us, now. Like you, I will always miss Buds...I look into his eyes and sometimes it hurts so much because I just want him here with me, to look into his eyes for real...but I can't have that, not in this life...it cannot be and so, I do the next best thing. I am glad that you have the loving support of your boyfriend and that he is sharing in this journey with you...it puts a little smile on my face, knowing that other people, who never had a chance to meet Bud when he was here, are meeting him now, and getting to know him. Please thank him, for sending you this beautiful picture (and thank you, for sharing! )...that is so sweet, our babies waiting at the door, for us to come home...if I was any good at Photoshop or Illustrator, I would try to draw Little B in there...maybe someone can manage that, one day, because it conveys a very special meaning...I love it. Thank you Jamie, for thinking of me and Buds today and for the hugs. Thank you for looking into my heart! It is true, my love for mom and my love for you and all of my adopted moms and dads...plus all of the fur babies in our tribe...the love in my heart continues to grow and grow! Mom always knew I was a lovey boy, but in heaven here at RB, we kids grow more and more love naturally, every day...so that it is expanding everywhere! Even bigger than Lake Ontario, or even the biggest one, Lake Superior! Dear A, little B told me he was going to visit you in a special dream...me and mom, we are so happy that you felt him close right in front of your bedroom, as soft cuddly baby little B, and you of course, were so gentle with him! He was pulling his sweet mom to him in the dream...a strong magnetic pull of everlasting love and to let mom know his essence when he was a little one. You two also have the most special mother and son relationship! He was planning the trip to Wal Mart too...he told me how much he loves saving money especially helping mom pinch pennies...this can be such a fun earthly game, pinching pennies and stuffing mattresses! My mom could use some help from Little B with saving, budgeting and accounting...she is not the best saver of money...she likes to spend it more than save really...plus she has to figure out U.S. taxes and Canadian what a headache! Two legged life is too complicated! Sweet A, you say it so well, that we are "on the path of love together"...yes, it is like we are walking parallel...we are on slightly different roads but we are always close and never far from each other! We are actually inseparable now...any feeling of separation is just an illusion...did you know that, A? Thank you for the turkey with the sticky rice...it was so yummy for us babies here! We always look forward to our delicious home made foods and treats! Dear A, I am glad you like the peaceful beautiful picture from Patchy's mom, it is like a true image of us from Above...it is so peaceful to look at and yes, little B is playing a game outside...what a game boy he is! Mom took some pictures of my Duck Pond where I loved to play...she will always remember me playing around down there...I was good because I always came back to her, but I know she always felt better when she could see me! You are so right, it is the perfect place for Golden Boys like me! Mom is uncertain about her life right now sweet A...but she is learning trust, and taking one step at a time. Like you know that Bedo is around to guide you, I am also here guiding mom...we all try to stay involved and help our moms and dads...it's just part of what we do because we love you so much! Please keep thinking positive thoughts, Sweet A...keep reading good books, eating healthy, walking and taking care of your babies, creating inner peace with a healthy mind and doing all of the special things that you always do to help! I hope you enjoyed lunch with your friend, Sweet A...I always love to hear from you - thank you, for all that you do and for your sweet thoughts and please know that little B is never far, just like in the dream...he is right there with you, always! Lots of Love and Special Furry Hugs to my Sweet A and to all our sweet moms and dads, thank you for all of the affections! How are you Bubbly Boy? it is Marsh one year today, A sure you two golden boys are playing together in the snow...It is so cute that A just found a picture from the internet that made A think of you boys...isn't that beautiful?, you kids are playing and waiting for us in Heaven! such a beautiful peaceful scenery, we will be together forever in such lovely world! Ah, that Little B, maybe he is so small that A can't see him, he may be hiding in the bush as Heaven is such a beautiful and big place! it is a great idea that mom can find an artist to do all you kid'portrait. A may do it too it would be sweet to have a portrait of all you kids together.. A is thinking of putting You Big Boy, Lee Lee, Patches, Max Little B and his AA girls together playing in the meadows and waiting for us to join you all someday...thinking of this beautiful ending, any hardship in life does not matter anymore, we are living peacefully as long as we have bread on the table! Yes A is doing all she can to be healthy and A wishes the same for mom...she needs you, please come to mom's dream Sweet Boy! A knows Heaven is a beautiful and fun place, but be a Hao Sun Chay! She loves you so much that she is saving all of your chew sticks..and that is very normal comparing to your crazy A...after the night she had a dream of Little B, she saw a plastic bag from a client that has Little B's marking on it..(Little B loved marking on bags and sometime he got caught by clients and the owner) it is odd that the bag has been there all along but she has not been paying attention...she removed documents from the bag and folded it tightly and took it home...now it is cover with a couple layers of plastic wrapping and she left it at Bedo's corner! very pathetic right! this is call "do anything for love" no matter how crazy and pathetic it is....this is a big secret that A only tell you and mom...well other aunties may know it too, but A is hoping that they will understand! Oh Yes, A enjoyed lunch so much, it was a very busy place, not to fancy in setting but it has great homemade dimsum that people always lining up for food! will send you some dimsums later, A sure you will enjoy them! A has to go back to work now, talk to you another time, sending lots of kisses, hugs and tummy scratches to you Sweet Boy and and Little B, AA Girls, Patches, Lee Lees, Max and Marsh too it is his Big Day today! Hugs to Sweet Mom and hope she will see you in her dream! 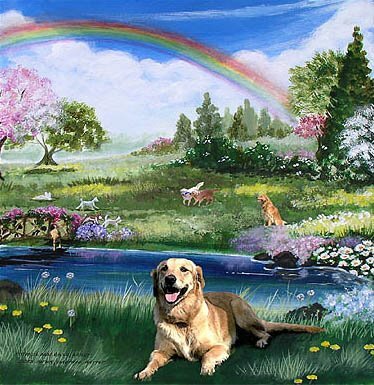 Thank you, for sharing the beautiful picture of us kids in Heaven! My mom really loves this picture so much...it made her cry, but a combo of happy and sad tears...happy because mom knows, that all of us will one day be together forever! Marsh is doing great, he has brand new angel wings after his first year anniversary - his mom is so proud of him! We had a beautiful celebration, and of course Patchy just had hers so we kids are always busy with feasts and anniversaries...not a day goes by that we are not celebrating together! I think Little B was hiding behind that big evergreen tree, on the right side of the picture? You can see just a little whisp of white there...I think he is being sneaky and just hiding in all of these pictures! We babies have come home, to our beautiful ending, sweet A and it is as you say, no two legged hardships will matter, because of our happy ending when you come and join us. Please don't be scared to let go and come to us when the time comes...it is a very peaceful thing, and you cannot imagine the happiness and your tears of joy will be flowing to fill up the beautiful lake just behind me, in the picture! You moms and dads are very sentimental - I smiled when mom saved my chew sticks and Bedo too...he knows you are saving his priceless mementos like the plastic bag and that they are going in his special place! Like you say, sweet A..."do anything for love". Mom just found a receipt for a toy that she bought me last March - it made her sad because she misses going into the pet store for me, misses getting me my marrow bones...there is still one in the freezer, but I know one of my pals from the lake will enjoy it, this year. Mom is giving Katie my probiotics...she wants Katie to stay healthy and live a good long life...I told Katie to keep close by, keep mom cozy and now she likes to lay on the leg of the recliner...she's a good pal! Katie is getting cheese curd treats too, once in awhile...it makes mom remember when I was here and Katie too, last winter and how mom had to be quick with Katie's treats because I would try to get hers too, because I love cheese so much! Thank you sweet A, for sending along some dimsums! They are one of my mom's favorites...there was a place she used to go in Rochester, not a fancy place but it had delicious foods - I know you have a great food choices in Vancouver! Thank you for all the hugs, kisses and tummy scratches...those are one of Lee Lee's favorites, and Bedo too! We all love our affections so much we can never get enough! See you next time A - love you and have a great weekend! Bedo likes playing in the snow now...it is snowing now in my little country town, where mom is...she is looking out over the lake it is very peaceful and she always thinks of me playing. Now she thinks of me playing with Bedo and all of our gang...she knows, she is not alone...we are always there, with all of you moms and dads just because you can't see us, it doesn't mean we are not there, because we are! Your words to your special boy have so much Love in them. Buddy had that Love every day with you and he is watching over his mommy with all the Love he always had for you and still does for always . One day we will be with our special angels again and it will truly be heavenly. Hold tight your memories and I hope you find many smiles through the tears. Thank you for writing. 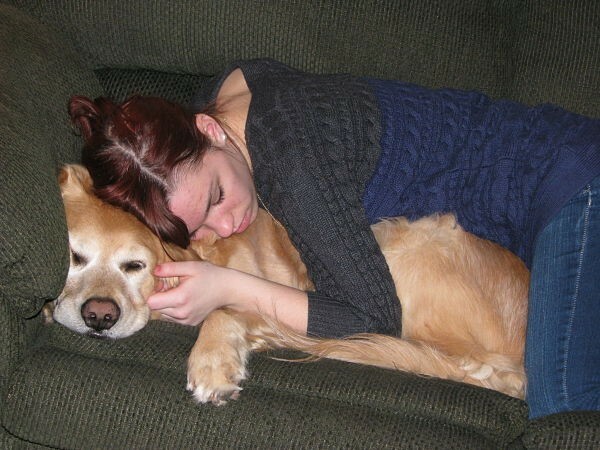 Like you love your Max and Marsh, I love Buds with all of my heart...he will always be my sweet golden angel boy. I have a few pictures of him when we first got him, he was so thin, even after spending 2 months with a foster mom...he had such a rough start in life. But I know, he loved his life so much and I am honored and privileged that he adopted me for his mom. He wasn't a one person dog, he had lots of love to share with everyone, and always will...that's just him, 100% lovey boy. You are so right, one day, we will be with our babies again, and with our beloved family members who have gone on ahead. Thank you, for dropping by to wish my dear boy a happy 4th Bridge Day. I know he was celebrating with your sweet boy Max, and all of our gang...they have all grown to be lifelong friends, and they are happy beyond any measure that we could possibly know or understand. Thank you, for sending along a wish for a dream of Buds - that sure would be most welcome, anytime! Hi dear friend. I was just thinking about you on this Sunday and wanted you to know. I love the picture of sweet Buddy and all the kids playing together. It is bittersweet. I'm hoping that you are "okay" today. I'm glad that you have cutie Katie there with you. Thank you for thinking of me and the Bud on Sunday's...it always seems to be the hardest day, emotionally. Just want my baby to come home, but I know he can't. 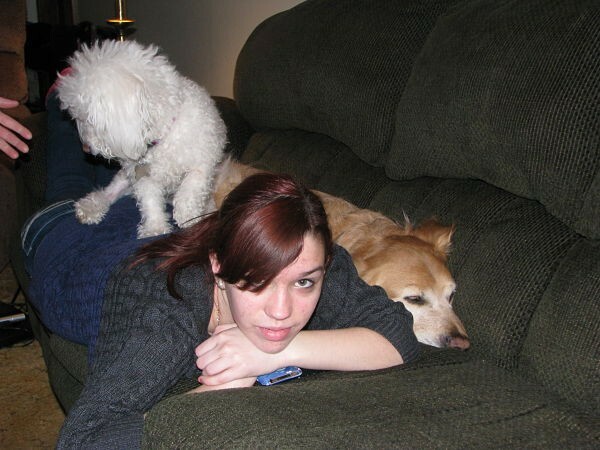 It does help to have Katie here, but I know she misses him...she always goes to his spot on the couch, and it was so much more fun for her, when she and Bud played in the snowbanks together. Life was better with Bud - just like you with your Patchy girl...life was just better with our babies here physically. I try to adapt to the spiritual connection, try to feel for his presence but like Melanie I just miss things like playing with his feet, brushing him, looking into his beautiful eyes, doing his teeth, hugging him, most of all...just knowing he was with me was the best feeling in the world, just knowing he was in the house, where I could always find him...always ready to go for a walk or play. Like you, I will always always miss him...and it will always be a heartache, knowing that I may have been able to prevent what happened to him, from happening. On that happy note, I'll stop now...hope you are enjoying the amazing January California temperatures...maybe you could send a little bit of that, up here in sub-zero land? It's mommy here...I miss you so much, baby. Mom is especially sad today...she is tired of looking at your empty spot on the couch, tired of the too quiet house without you here...baby, tired of no beautiful Buddy paw prints in the snow...mom wants you back so much! Mom's heart is broken, baby...mom tries to be strong, just sometimes it is so hard! Your Sweet A misses Bedo so much too, you boys try to be around a little bit more, especially for Chinese New Year, OK? It is so sweet of your A, to be sentimental and heart broken thinking about your mom having to leave this place, that was once our happy home...that you loved so much. But it is not a very happy place for mom anymore, baby. Although there are some sweet memories of you, it is also hard for mom to stay here, too, because mom feels so lost here, without you. Mom feels lost everywhere, without you. I know you will stop by and write your sweet A a letter soon, mom has to get ready for yoga now. Mom is officially a Canadian citizen, baby, the ceremony was in Ottawa on Monday - exactly seven years to the day since mom officially landed in Canada, and then later that year 2007, was the biggest blessing of mom's life, when you came to be with her that August! Love you so much, baby...mom thinks of you all the time, you and all of your sweet pals mom knows you are safe and happy, just misses you too much mom should know better, but sometimes her heart takes over her head. Please give all your sweet friends big hugs, kisses and tummy scratches - you angels are so loved! I wanted to let you know that you are on my heart today, I feel so deeply your pain and longing for your sweet Buddy. This pain seems have a life of its on and just consumes us doesn't it. Some days the just is nothing else except the missing, the longing, the aching for our babies - it really is exhausting mentally, physically and spiritually. There is just a whole lot of emptiness....and nothing is worthy to fill the void - even the good memories that we try to cling to are just so very sad - because they are only "memories" - sometimes just a painful reminder of the joys we no longer have. Thank you, for your prayers and words of comfort. It is so strange, isn't it...how this grief takes on a life of its own. I know dear friend, that you understand fully the awful feelings of emptiness, despair and utter longing. I don't know how I held it together at yoga yesterday, especially when first arriving to class. But, it did help for a brief time, as doing the breathing and corresponding movements do help to put one squarely in "the moment"...even if short-lived. I know what you mean about the memories being only that - just memories. It doesn't seem like much to hold onto, some days. Even looking at pictures or videos, I don't know if it helps, or hurts...but I am glad to have them, because I could not bear to forget even the smallest part of his beautiful self. I agree with you, that it will only be that special "day"...when we leave this life to be with our babies...that is the one and only event that could ever truly cure this constant ache and longing. You are so right Melanie, when you say that you would rather take on the burden and pain of missing sweet Lee Lee, rather than the other way around. It's so true, she would be completely lost and confused without her Mama, and she would always always look for you. I used to take Buds to this huge doggy park in Ottawa - he loved it there, and had so many fun pals to play with. Well, one time I stopped to chat with one of the pet parents and he went on ahead with a group of friends, romping through the meadows. A few minutes later a woman came down the path, and asked if one of us owned this beautiful golden retriever boy named Buddy? She said he had become a bit frantic, and was looking all over for me and could not find his way back. It was the only time I can remember, when he ever let mom out of his sight! And me too, I always kept a close eye on him, although I felt a bit more relaxed at this particular park, because it always felt so safe there, with people and dogs that we knew well. I remember feeling so badly that he was panicked, even for just a few moments...I never wanted him to feel abandoned or insecure, ever again. What a happy reunion, when I ran up ahead and found him. When he caught sight of me, he ran as fast as he could into my arms. It was a moment that I will never forget. Like you, I am thankful that our babies have found peace and joy and all of the blessings of heaven. It is up to us now, to try our best in every moment to do our best for them, to continue honoring them as best we know how. I know you are hurting so much these days, Melanie...I've had a sense of how hard it is has been for you lately, and I know the weeks ahead will not be easy for you. I am thinking of you too, today...every Friday, as you share the precious memories that you and Lee Lee created, together. Please know, that you and sweet Lee Lee are daily in my thoughts and prayers. P.S. I don't know if you remember the card Joelee made me, when Buddy was sick? You mentioned in your thread a couple of weeks ago, wanting to see it. Well, I finally found it - it was here at my mom's in a folder, so I will take a picture of it when I get back and upload it. I feel the same way about the pictures (I haven't been able to watch the videos yet) - I miss her so desperately and want to look at her and think of her, but this is what happens (crying yet again) I can't win either way. It is just too much to bear Elise - I hope she sends me another sign soon. P.S. I do remember the card... I looked for it in your albums - but couldn't find it yet - I will check back later. I am sorry, that you find yourself in such a difficult and almost "unreal" place, and that you just sort of "function" at work, going through the motions. It is just a terrible feeling, but as you say, hopefully it will pass, or at least get a bit better, someday. It feels like being on a roller coaster, a few better moments, then too many "down" moments, missing them and then sometimes just sort of blah...flat line. I had a bit of a bright spot yesterday, a Chinese New Year sign from Double BB boys (or so it felt to my heart)...in the form of a new online crypto currency, that has taken on a life of its own. It is called Dogecoin, and an entire community has grown up around it. Interesting how I came to learn of it...felt like it came from the two BB boys, so that gave my spirit a lift, as it felt like a guided event. That is so sweet, that Lee Lee would come looking for you, even in the shower! Buds also loved being in the bathroom with me...(of course, he was always looking into the basket, for the good old Kleenex's!). I like taking a bath, soaking and relaxing sometimes, and I would dip my "outside" arm in the water, and he loved to lick the water off, then I would dunk my arm again, and he would lick it off again...it was a little game that he loved playing. Then, he would lay down on the bath mat beside the tub, and wait for mom to be done. I know what you mean when you say it is hard to describe the relationship you have with Lee Lee...when our connections are so incredibly deep, so very intimate and profound, it is no wonder that we feel a part of us has been "ripped away". I know you miss her so much...it doesn't seem fair at all, but I try to have faith and believe that God has a higher purpose in all of this, not only for our babies, but for us, as well. All of us here, would give so much to have our babies back...we would all give anything, wouldn't we? I was reading a post earlier today, and a member was describing a dream that she had, about her baby Emma, who had passed. Her baby asked her mom in the dream, why she wanted her to come back? She felt that it was a good question, actually. As it turned out in the dream, her baby started getting sick again, as she wasn't really happy, being back. Then, this mom wrote (in so many words, my paraphrase) that this must be the way it is supposed to be - our babies could not continue, they did not feel good anymore, on this earthly plane...their bodies were worn out, which is why they chose to go on ahead, to their new life, where they are free of sickness, pain and suffering. So as hard as it is for us, because we just miss them so much, they have arrived to that special place, where they belong now. I am trying to get that through my head...that they actually do belong there now, instead of here. Please never apologize Melanie, for "going on"...talk about "going on"...look how many words I have subjected you to, already! I did read your beautiful post in the email and was wondering what was going on, why it wasn't appearing on your thread, as I wanted to reply. I hope that Ed can sort it out for you, very soon. I'm sorry if I sent you on a wild goose chase, regarding the picture of Joelee's card. I still have to take a picture of it, and then resize and get it uploaded to an album...haven't done that yet, as I left my camera at the house. Please know, that you have also helped me, so much...in more ways than you could ever know. It makes me glad, to have been of some comfort to you, also. I truly feel blessed, to have the loving support of you, Bedomom, Jamie, Max's mom and dad, brenrae, Mihaela, Stephanie and so many others who have given and continue to give, so much love and support. Wishing you a sweet visit or sign from your dear Lee Lee baby Rosie...Lee Lee, please come and comfort Mama soon, she needs you, Country Blossom! Thank you, for the Sunday wishes for Buddy to come...am headed to church tomorrow, to pray for our babies, and for our broken hearts. I'll try and not write another 'book' this time - just a note to say that I'm so glad to hear about your "bright spot" yesterday - they are few and far between sometimes, aren't they - I guess that makes us appreciate them more. I loved your story of Buddy - I know you miss those times - Lee Lee had a habit of licking the condensation from cups and glasses - she liked it for some reason. Our sweet babies... they were just a part of every aspect of our lives. I read the post you mentioned too - I am still trying to reconcile the thought that anything good can possibly come of this for me. No worries about the card - I am just anxious to see it - when you have time... Bye the way, the third time was the charm with the post - it now appears on Lee Lee's topic - Ed kept on trying and got it to work - it is still a mystery. Well....I'll run on now - I hope your Sunday is blessed and peaceful.